V-groove bending allows us to produce parts that don’t have the rounded bends typical of thicker aluminum. The result is a nice crisp bend that can be subtly manipulated on site as required. Additionally, when you bend thick sheet in the standard fashion, paint has a tendency to crack along the bend or even flake away, which has resulted in most customers opting for post painted parts. Post painting may have a long lead time and is usually expensive. 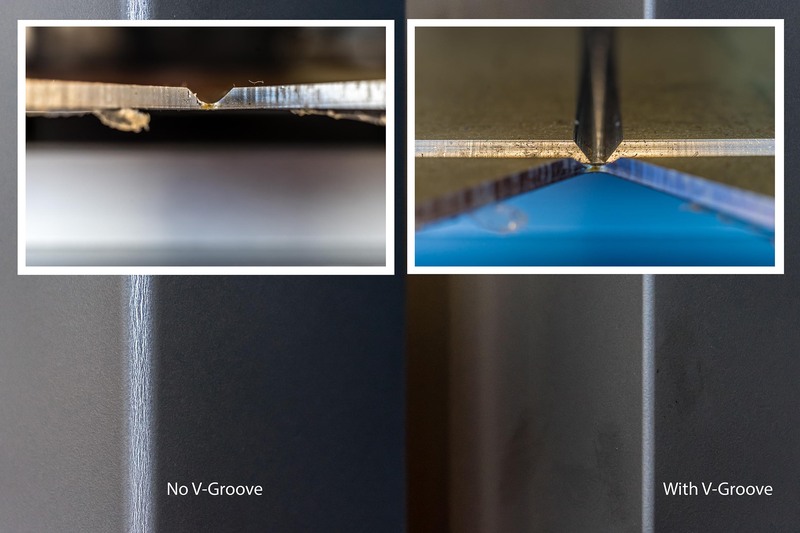 With V-grooving there is no paint distortion on the bend, which allows us to produce parts from pre-painted sheets and maintain a quality finish. The parts can be shipped flat and easily bent on site which reduces shipping costs and the risk of damage in transit. People with disabilities encounter accessibility challenges on a daily basis. Often there are unintended barriers because of how the features are designed and constructed.